According to Archinect, the University of Kentucky (UK) is close to selecting an architect to design the school's new home for its College of Design, which is now scattered in various buildings across UK's campus. The six finalists are The Living, Marlon Blackwell Architects, NADAAA, Oyler Wu Collaborative, Studio Gang, and Trahan Architects. 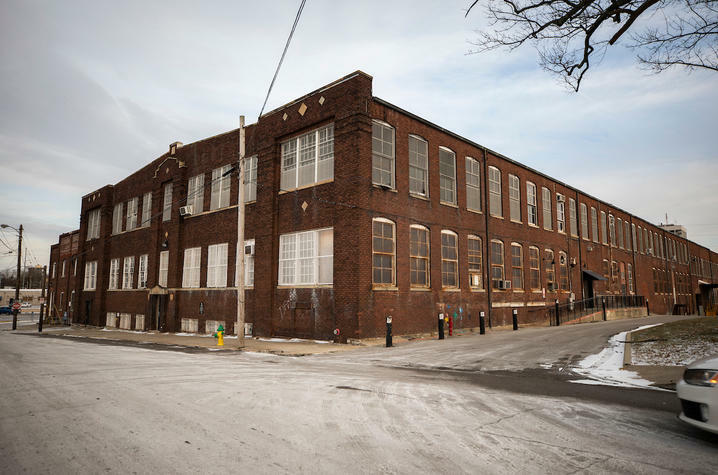 The winner will lead the redesign of the school's Reynolds Building, an old brick tobacco warehouse. 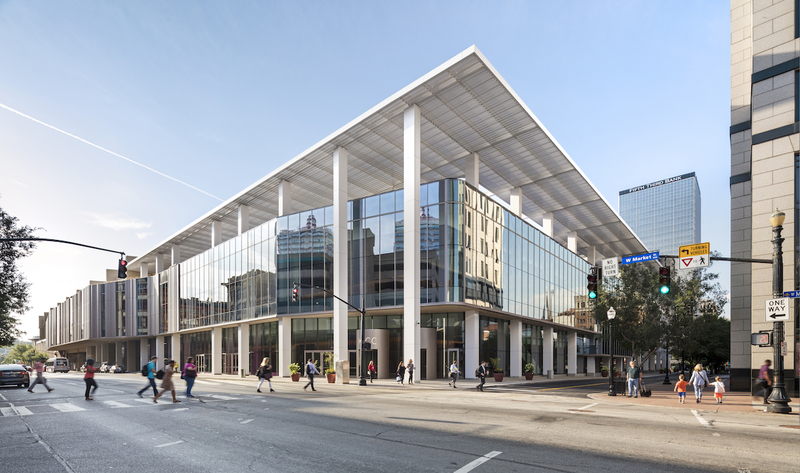 According to school's news service, "With 140,000 square feet, the new home in the Reynolds Building will allow for the implementation of the college's ambitious plan to launch new initiatives, expand existing programs, establish new lines of design research and foster creative scholarship." Shigeru Ban Architects (SBA) has been selected to design and plan a new 420-acre campus for the owners of Kentucky Owl bourbon in Bardstown, Kentucky, just south of Louisville. Kentucky Owl Park will convert the former Cedar Creek Quarry into a tourist destination with a distillery, bottling center, and rickhouses, along with a stop for a "vintage dinner train" that will bring visitors in. 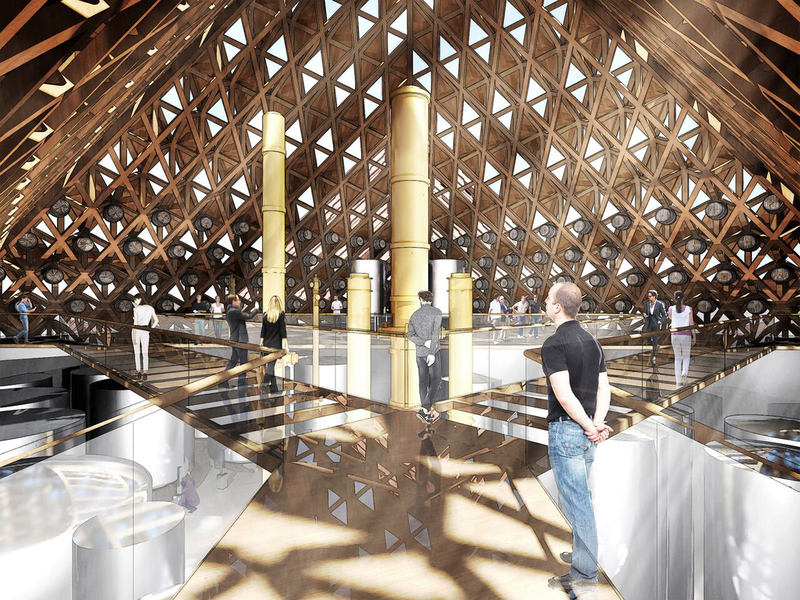 Renderings from SBA show three timber pyramids housing the distillery at the center of the complex. The three matching buildings are clad in various proportions of diamond-shaped wood and glass panels, presumably to create different lighting conditions inside. The old quarry pits on site will be filled with water, setting the complex in a series of large ponds. The site plan indicates planned spaces for fishing, swimming, and other aquatic activities, along with an art gallery, convention center, and, appropriately enough, an "owl forest." The $150 million project comes on the heels of Stoli Group's purchasing of the Kentucky Owl brand in 2017. The bourbon line initially debuted in 1879 and was produced not far from Bardstown by Charles Mortimer Dedman, but production was discontinued in 1916. Dedman's descendants resurrected the line in 2014 and sold it to Stoli soon thereafter. According to an interview with Dmitry Efimov, head of Stoli Group’s American Whiskey Division, in the Lexington Herald Leader, Stoli was not previously producing brown liquors, and the new park evinces their intention to expand in that area. While Kentucky Owl will continue to be produced separately in small batches, the new distillery will mass produce other, as yet unannounced, brown liquors. 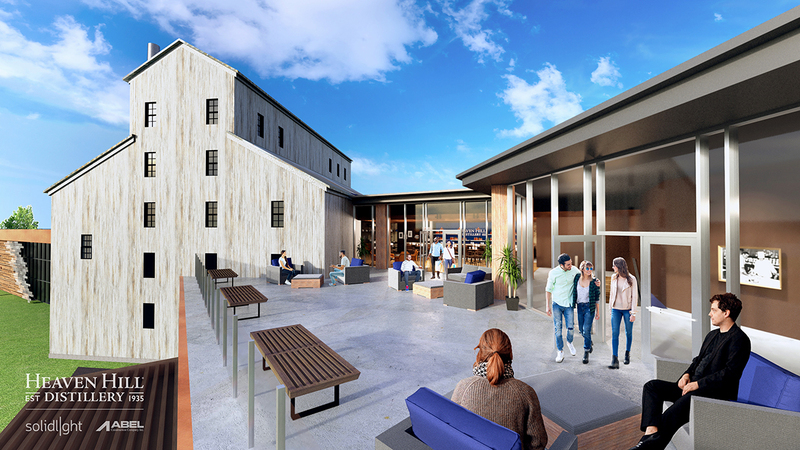 Stoli plans to integrate the new park into the Kentucky Bourbon Trail, a collection of distilleries that host tastings and tours in the area. Earthscape and Design Workshop are the landscape architecture firms on the project. The complex is scheduled to open in 2020. New York–based SCAPE Landscape Architecture has released new images of an urban park in the heart of Lexington, Kentucky. The city, working with the Bluegrass Community Foundation, has spearheaded the project which will completely transform one of Lexington's main public spaces. The Town Branch Park is part of the larger Town Branch Commons project—originally featured in The Architect's Newspaper's October 2016 issue—which proposes to uncover Lexington's long-buried Town Branch Creek. By revealing the waterway, the city will gain a new large-scale green space, complete with natural and artificial water features. The park will become a major part of the Town Branch Greenway, which connects existing downtown parks. The downtown portion of the Greenway is also being designed by SCAPE. When complete, the system of bike and pedestrian trails will stretch over 22 miles. “Every great American city has a great park,” said Kate Orff, founder and partner at SCAPE, in a press release. “We are very excited for this park to put Lexington in a competitive environment and further enhance the quality of life. This richly textured, activated park space is going to be a big draw for families and businesses.” SCAPE's initial design for the project was picked in a design competition in 2013. Now that the project is moving forward, SCAPE has amassed a team that includes AECOM, Lord Aeck Sargent, Gresham Smith Partners, Element Design, and Beiderman Redevelopment Ventures. Bulleit Distilling Co., maker of Bulleit whiskey, celebrated its 30th anniversary in a big way with the opening of a completely new distillery (and probably a few sips of its amber-colored product). While Bulleit is now owned by London-based Diageo PLC, the grand opening of the new facility also coincides with founder Tom Bulleit’s birthday. Set on 300 acres outside Shelbyville, Kentucky, the new distillery leverages the latest in warehousing and distilling processes to reduce its impact on the environment. Included in the new facility is the first industrial solar array in the area. The solar array is able to collect enough energy to run all the distillery’s on-site mobile equipment. An overall modular design also means that the layout was able to be carried out with as little tree clearing as possible. 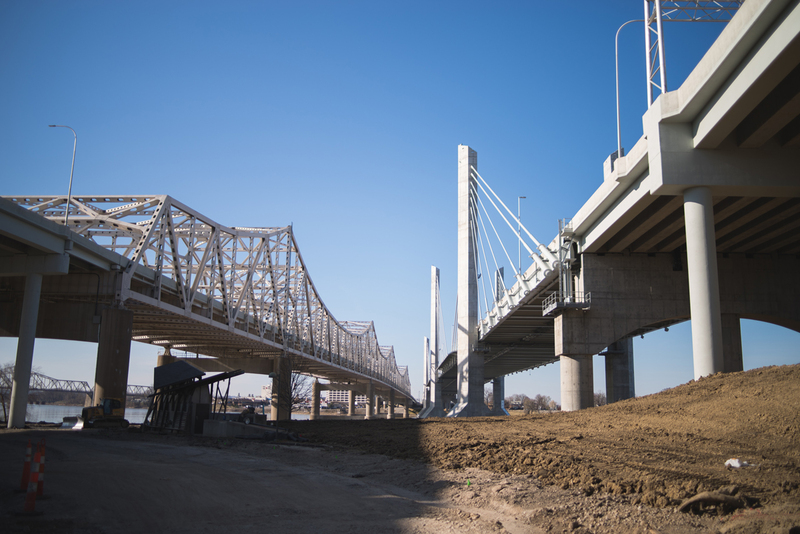 The land planning, civil engineering, surveying, and landscape architecture were all carried out by Louisville-based Land Design & Development (LD&D). LD&D was also the local planning consultant. Until the completion of the new distillery, Bulleit Bourbon was distilled at another company’s facility. 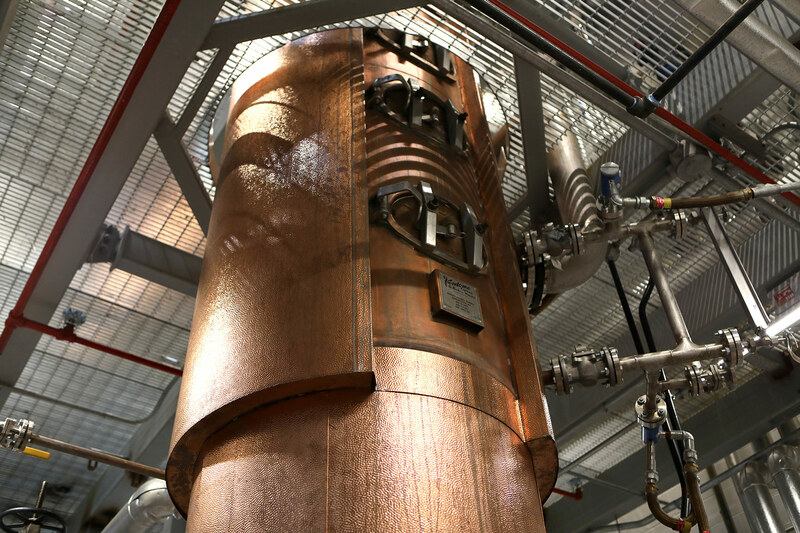 Now able to produce 1.8 million proof gallons of whiskey per year in house, Bulleit has greatly improved control over its own distilling process. The company can now more easily explore the production of other lines of whiskey as well. At the heart of the operation is a 52-foot still, designed and built by Louisville-based Vendome Copper & Brass Works. Four barrel houses on the campus are able to hold 55,000 barrels for aging. “Seeing this distillery come to life has been a truly surreal experience that couldn’t have been achieved without the tireless work of so many men and women,” said Tom Bulleit at the opening. Yet the story of Bulleit is just as surreal. According to Tom Bulleit, the first Bulleit Bourbon was made by his great-great-grandfather, Augustus Bulleit, in pre-Civil War Kentucky. The legend goes that after loading up a boat with barrels of bourbon and heading off to New Orleans in 1860, Augustus was never seen again. While the $115 million project is not yet open to the public, guests can visit the new Bulleit Frontier Whiskey Experience in the company’s original Louisville, Kentucky, distillery as they work their way down the Kentucky Bourbon Trail. One of Kentucky’s most iconic homes is now on the market. 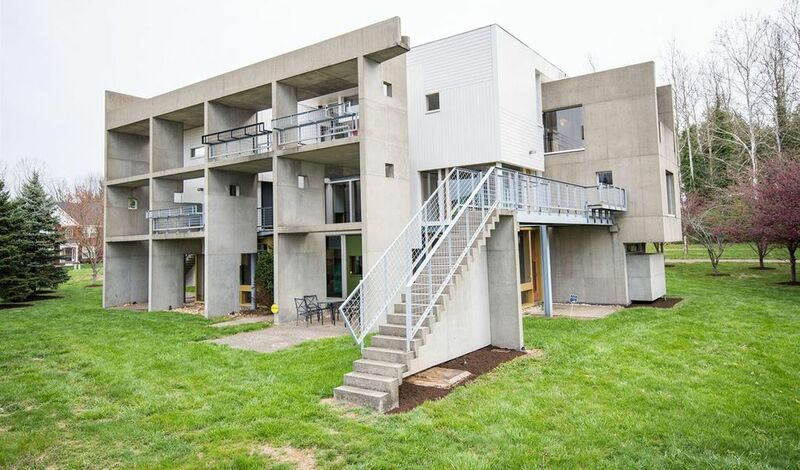 The Miller House, designed by Le Corbusier protégé José Oubrerie, is listed for $550,000. That price is nearly half of what the home was sold for in 2008, making this a tempting bargain. Located in Lexington, Kentucky, the single-family home is noted for the complex way in which the interior spaces interact. Held together in a monolithic concrete frame, the home is comprised of three separate dwellings. This allows for family members to each have their own space while living in the same house. The original clients were an older couple, who wanted a home where their grown children could come and stay. Critics have often cited this as a commentary on the role of architecture in mediating family relationships. The house’s suburban setting seems to only exaggerate this point. Completed in 1991, the Miller House is filled with intricate detailing. Woodwork, steel, and concrete are mixed freely throughout, with bright pops of color being used in surprising ways. Nothing in the house seems typical. Its 5,000 square feet are sliced and divided into rooms, lofted spaces, bridges, balconies, and atria. The nine-square grid plan the house is based on is nearly completely illegible thanks to all of these unconventional meetings of space and material. The house has nothing of the austerity so often associated with modernism, despite its very clear modernist pedigree. José Oubrerie was part of Le Corbusier’s studio in the early 1960s. Since then, he has held numerous faculty and administrative roles at different universities. In the late 1980s, he was dean of the University of Kentucky College of Design. In the 1990s he taught and was chair of the architecture department at the Austin E. Knowlton School of Architecture at Ohio State University. He has also taught at the New York Institute of Technology, Columbia University, The Cooper Union, the Polytechnic University of Milan, and the Ecole Nationale Superieure des Beux-Arts. 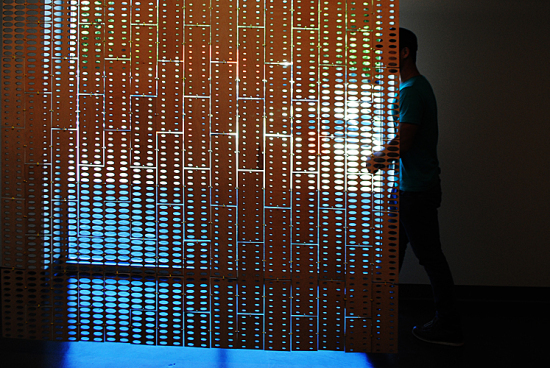 Currently he is a visiting professor at the School of Architecture at the University of Illinois at Chicago. The listing also includes a virtual tour of the entire house that is well worth checking out. Lord Peter Palumbo, outgoing chairman of the Pritzker Prize for Architecture, recently looked back on his decades-long ownership of Kentuck Knob, the Frank Lloyd Wright house in western Pennsylvania, not far from Fallingwater, that is celebrating its 60th anniversary as well as the 20th anniversary of being open to the public. 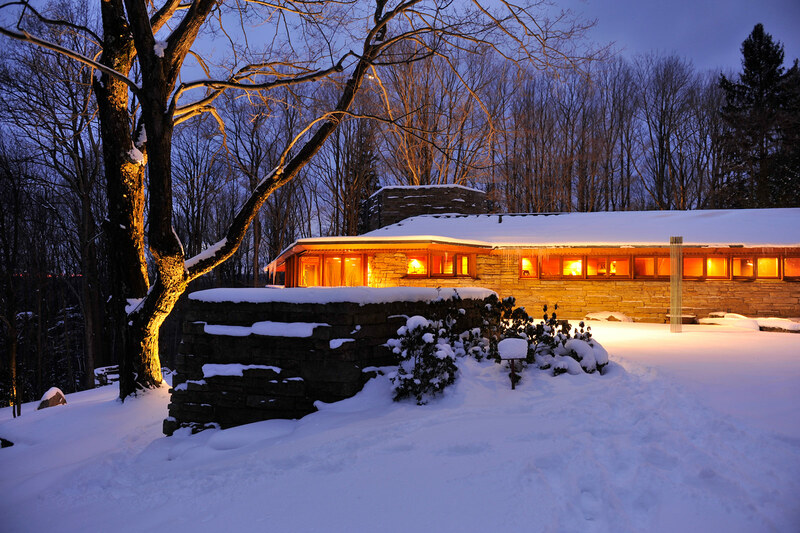 Wright built Kentuck Knob—a small, one-story Usonian house on the crest of a knob, or hill, 2,050 feet above sea level, in Chalk Hill, Pennsylvania, in the Laurel Highlands mountain range six miles from Fallingwater—for I.N. and Bernardine Hagan, an ice-cream maker and his wife. He visited the house in the mid-1980s on a trip from Chicago (he once owned the Mies van der Rohe Farnsworth House outside Chicago, as well as Le Corbusier’s Le Jaoul Houses, outside Paris, selling all of them subsequently). “I fell in love with [Kentuck Knob], but I couldn’t get inside it. I fell in love with the outside, and said to myself, ‘If it’s as beautiful inside as it is outside, I must do something about it.’ So I went back six weeks later and effectively bought it then,” he said. The architectural core of the open plan house—which is built of native sandstone and tidewater red cypress—is its hexagonal, stonewalled kitchen; its two wings are anchored by stonewalls, which rise to penetrate the horizontal line of its copper roof. Cantilevered overhangs and expanses of glass integrate its interior and exterior. Shortly after Lord Palumbo purchased the house, a fire destroyed the master bedroom and bathroom. He was fortunate enough to find a retired Carnegie Mellon architect, Robert Taylor, who had worked on the home when it was built, to oversee the reconstruction. Another change wrought by the Palumbos at Kentuck Knob is the addition of outdoor sculptures: Over 30 works by artists such as Andy Goldsworthy, Sir Anthony Caro, and Claes Oldenburg have been placed in the landscape around the house and along the trail to the visitor center. They have also converted Kentuck Knob’s greenhouse—which once stood at Fallingwater and was brought to Kentuck Knob by the Hagans in the early 1960s—into a gift shop and cafe, and have restored the house’s original, triangular, man-made pond, built from boulders by Taylor. A National Historic Landmark, Kentuck Knob can be seen only by formal tour, offered in 40- and 90-minute lengths from March through November and on a limited basis in December. The ambitious project, which just received a major $14.1 million funding boost from the U.S. Department of Transportation, will carve pedestrian and bike paths through the heart of Lexington, creating new green spaces and linking with regional trails at both ends. To create freshwater pools—SCAPE calls them “karst windows,” in reference to similar naturally occurring formations—the design will tap old culverts (essentially large pipes) that previously kept Lexington’s karst water out of sight. A big part of the component of this piece is educational, so once we grab people’s attention, we want—without being too preachy—to give them some information to help them make better decisions every day. 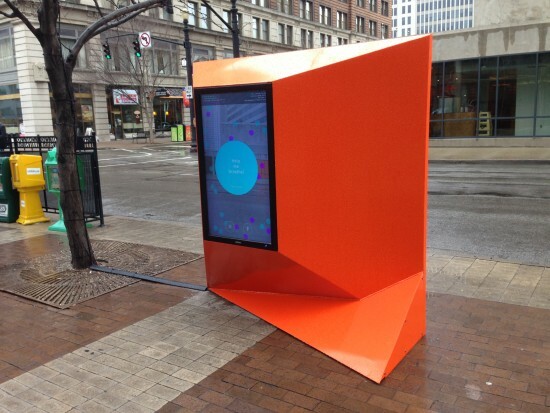 Urban Matter conceived the short-term piece with the Office of Civic Innovation, Louisville Metro Government, and San Francisco's Creative Commons. On their website, the firm said they hope the project “creates awareness, identifies sources of pollution and propels the public to take action.” Open in time for a health symposium attended by Prince Charles, the piece will be up for six to eight months.